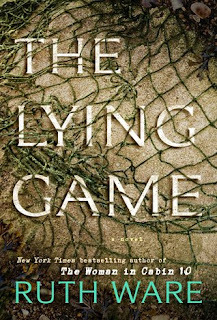 The Lying Game was one of my most anticipated reads of the summer. I absolutely loved The Woman in Cabin 10 as well as In a Dark, Dark Wood. I was hoping for the best with Ware's latest novel, but it fell a little short. The atmosphere was great, the characters were interesting, but I found it to be a little boring. I loved Ware's first two novels because the reader and the characters felt trapped in one place with terrible events surrounding them. There was constant suspense and I felt like I was trying to flip each page faster and faster to get to the finish line. The Lying Game was definitely slower to build and even though the characters were at the mill house for a majority of the book, I never felt that creepy atmospheric suspense that I loved so much in the other novels. Now don't get me wrong, it was still an interesting book, it just wasn't my favorite. Ware's writing skills continue to grow in her latest novel. I enjoyed the depth of the characters as well as the insight into their past. It was definitely a bit different than I was expecting, but I would still highly recommend this to readers who enjoy a slow burning suspense novel. It doesn't have the same amount of chill and violence as her other novels, but it is definitely an enjoyable read! *Thank you to Scout Press/Gallery and NetGalley for sending the novel in exchange for an honest review.